Something soothing and can be taken with you on a flight! 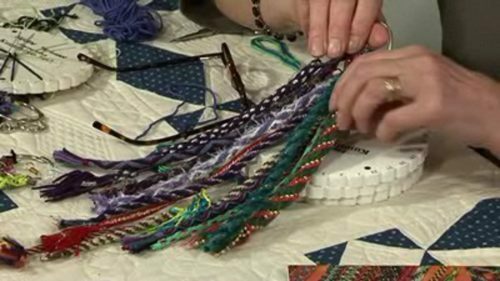 Helen Deighans book on braiding is packed with new ideas for using the wonderful Kumihimo tools – including adding beads as you braid! An experienced author and teacher, Helen again uses her skills to explain the techniques in a non-technical, easy to follow way. Her enthusiasm for this craft shines through, making even the most reluctant sewer want to have a go. 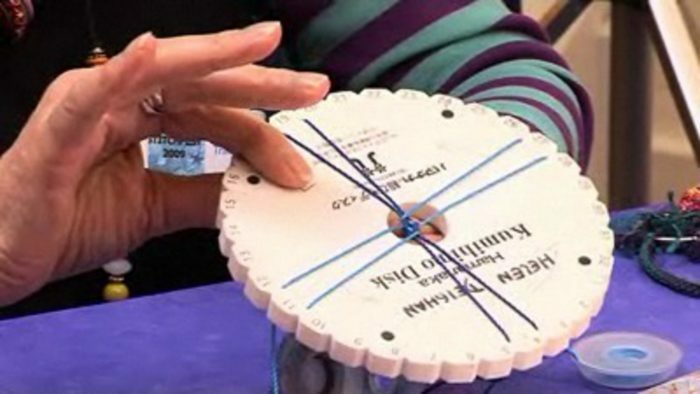 The special braiding discs can be found on the shopping pages. As a professional textile artist, I’ve been making quilts since 1984. Initially working from existing patterns, I soon started developing my own designs. And, when I couldn’t find the right colour or shade to fit – I dyed my own. Over the past ten years I’ve created many exciting dyeing effects using everyday household objects – from cat litter trays and drain pipes to my now famous plastic freezer bags! My latest passion is designing and making textile coil pots. In January 2002, I opened my new studio in rural Hampshire. It’s purpose built for both dyeing and sewing, with plenty of light and space – the perfect environment for my classes and workshops.